Not all schools have the same amenities and, ultimately, access to opportunities. Funding, size, location, and many other factors influence what educational opportunities students have access to. In a recent guest blog for Education Commission of the States, I shared my story as a student in a school in a rural area and information from a report I co-authored. The report, Rural Students: Technology, Coursework and Extracurricular Activities, examines rural high school students’ access to technology — both internet and devices — and rigorous coursework. What did we find? Rural students have less access to technology than their non-rural peers. This “digital divide” impedes rural students’ course-taking success and compounds their ability to participate in online courses and other opportunities for personalized learning. In effect, the gap may be broadening education inequity within U.S. schools. How can we help ensure rural students are not left behind? ACT’s experts suggest stakeholders and policymakers can take important steps so that every student succeeds, no matter where he or she lives. What policy recommendations does ACT have? 1. Increase opportunities for rigorous course taking. Students must have access to and be encouraged to take a minimum core curriculum of four years of English, three years of mathematics, three years of science, and three years of social studies. The report found that students in rural areas were less likely than non-rural students to complete (or plan to complete) the ACT-recommended core curriculum (76 percent vs. 81 percent). According to the ACT K-12 policy platform, ACT encourages all states to specify the number and kinds of courses that students need to take to graduate academically ready for life after high school, which include the minimum core curriculum. 2. Expand opportunities for personalized learning. Students need the opportunity to receive personalized, student-centered learning. In the case of the rural students in the survey, personalized learning could help provide greater access to advanced coursework. 3. Improve access to technology at school. Although the Federal Communications Commission funds the Federal E-Rate Program, which provides eligible schools and libraries discounts of up to 90 percent to fund affordable telecommunications and internet access, six percent of schools still do not meet federal connectivity benchmarks—and the vast majority of those schools are in rural areas. The Federal E-Rate program must continue to fund access to affordable broadband internet to rural areas and completely close the gap between schools with broadband access and those without. 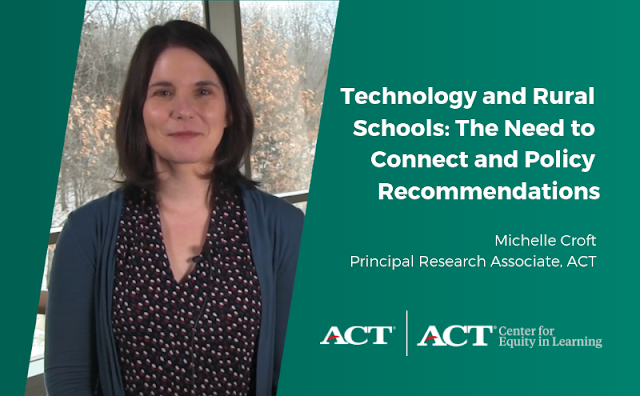 How is ACT improving access for all students, including by getting those in rural areas connected? ACT is dedicated to providing relevant research to improve equity in education. Findings from our recent research reports—Rural Students and the Digital Divide—continue to spread. This awareness will help policymakers create research-based solutions at the local and national level. ACT believes providing all students access to technology is a vital and necessary step toward closing gaps in equity, opportunity, and achievement. All students should receive personalized, student-centered learning, and in the case of the rural students in the survey, further technological access could help provide greater access to advanced coursework. ACT’s Center for Equity in Learning continues to forge new partnerships dedicated to finding solutions. One example is a project with the Federal Reserve Bank of Dallas on its efforts to design and implement an effective model to close the digital divide for underserved families in the Rio Grande Valley. This community-led partnership has already resulted in changes in Community Reinvestment Act (CRA) language to include digital equity investments in communities that will provide funding to close the digital divide. The Federal Bank Reserve of Dallas has also published recommendations for CRA Funding in community-led equity projects for digital equity. Research around education equity, like this series of reports, helps shed light on how differences in access can result in negative impacts on students. We invite you to read our recent findings and share them with your network. Together, we can help more people achieve education and workplace success. LinkedIn: How can we ensure rural students aren't left behind? ACT’s Center for Equity in Learning, which focuses on closing gaps in equity, opportunity and achievement for underserved populations and working learners. Through purposeful investments, employee engagement, and thoughtful advocacy efforts, the Center supports innovative partnerships, actionable research, initiatives, campaigns, and programs to further ACT’s mission of helping people achieve education and workplace success. ACT State and Federal Programs, which is dedicated to positioning ACT as a thought leader at the national and state levels to inform and influence education and workforce policymaking and is made up of four interrelated units staffed by experts in policy development, federal and state government relations, and outreach to states and national organizations. Together, State and Federal Programs provides insights and resources to states, workforce and education entities, and other organizations to help individuals navigate their education and career pathways. ACT Research provides thought leadership supporting education and workforce solutions and influences policy and practice at the national, state, and local levels. Our commitment to those spanning the K-career continuum is demonstrated through a wide variety of assessment, reporting, and consulting services.